Classic Head Large Cents were coined between 1808 and 1814 at the US Mint. 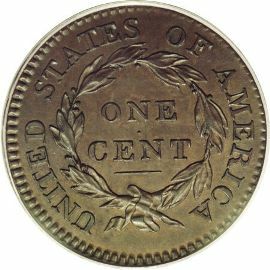 This design was adopted when new Mint Director Robert Patterson assigned John Reich to redesign all denominations from the half cent to half eagles. Reich was a very talented engraver from Germany who escaped the Napoleonic Wars, and sold himself into indentured servitude to come to America. inscription "LIBERTY". The portrait is surrounded by 13 6-pointed stars, seven to the left and six to the right, with the date below the entire design. The reverse design bears the denomination "ONE CENT" inside a laurel wreath, and tied by a bow at the bottom. The entire design is encircled by the inscription "UNITED STATES OF AMERICA".